New In The Guardian: Audiences Down, Christmas Ad Revenue Up: Has The TV Industry Gone Mad? The television industry is at a curious crossroads. Live viewing – and hence ratings – are down, but revenue from TV commercials has gone up. We’ve seen banner months for TV advertising in the UK and US this autumn. And while this initially seems like a curious paradox, there is in fact a rational explanation. “No other medium gives you the reach that television does.” That story has been foisted upon advertisers for the past half a century. Surprisingly, however, it’s still true: even in the age of mobile and virtual reality and YouTube videos with billions of views, nothing even comes close to television in terms of reach. It’s a lesson that has not been lost on advertisers, many of whom are starting to see the web as a black hole of fraudulent views, spurious statistics (three seconds for a “view”) and, more recently, ad blocking software. While people may be skipping past adverts or playing with their smartphones if they do watch them, at least, the thinking goes, they are aware of them, and hopefully for more than three seconds. Yes, ratings are down. Live viewership in younger demographics is sinking below 50%. And so what did the networks do in response? They ran fewer ads, to counter the appeal of ad-free streaming services such as Netflix. Which means there’s less of that (still) very desirable inventory. We now have the same number of advertisers vying for fewer available commercial slots. When demand exceeds supply, prices go up. Even if far fewer people are watching. And we can expect that trend to continue as several new pieces fall into place. The first is addressable advertising, such as Sky AdSmart, which allows advertisers to target specific audiences much the same way they do on the web. While the television version is unlikely to include the pinpoint precision of web ads (that would eliminate the “reach” part) it will allow, say, cosmetics companies to target certain ads to female viewers – versus the current model, which is just “shows watched by a large number of female viewers”. Here, the lack of waste from the new audience parting segmentation will make the ad units more valuable and networks should be able to charge more for them. As more viewing is done digitally, advertisers will be able to track their ads, who’s watching them, and what other shows and adverts viewers watch. Add in data from social media – Facebook authentication, whereby viewers use their Facebook credentials to log in to their pay-TV accounts is rapidly taking off – and you have data about millions of viewers, another factor that will help to keep TV adverts valuable to advertisers. Better measurement will also help keep TV ad revenue in the black. In the US, Nielsen, after several years of waiting, finally announced the launch of their Total Audience Measurement system. This will measure live and time-shifted viewing and will provide separate ratings for TV shows and for commercials. Since the networks will now see ratings benefits from allowing their programs to be viewed anywhere and everywhere, they will throw away the restrictions they had previously imposed on such viewing. That means more places to run the commercials they sell, thus further boosting reach. The holy grail for this new world of television advertising is fewer, better targeted commercials which the networks can then charge more money for. It’s a system that may fit everyone’s needs, as witnessed by recent developments at the popular US streaming service, Hulu. Hulu charges $7.99 a month for a subscription service that includes about 90-120 seconds of advertising per show. In September, Hulu rolled out a new option, whereby viewers can pay an extra $4 a month and avoid commercials altogether. It seemed like a winning solution for a world where viewers seemingly do whatever they can to avoid advertising. That’s why many observers (myself included) were surprised to learn that the ad-free service was not nearly as popular as the ad-supported one (especially given the fact that they both involve paying a subscription fee). While Hulu has not released exact figures, they have stated that “(a)s we predicted, the overwhelming majority of users have signed up for (or stayed on) the limited commercials plan”. The final piece of the puzzle is cord-cutting, which seems to rapidly be becoming a non-issue. That’s because the pay TV service providers, most all of whom also provide broadband service, such as Verizon, Sky and Virgin, have taken an “if you can’t beat them, join them” approach to the new streaming services. They are partnering with the likes of Netflix, HBO Now and others, so they can offer those services to their broadband customers who don’t want the traditional 1,000-channel bundle, while keeping them firmly inside the ecosystem. Since many of the standalone online video services are ad-supported, advertisers get even more places to reach their audience. Increased or even stable revenue is still far from a slam-dunk. There is a lot that could go wrong and certain types of advertisers (eg retailers) may prefer the immediacy of the web versus a TV universe where most viewing is time-shifted. Still, the odds are looking favourable, something the TV industry has not heard in quite some time. Just a few days after rumors surfaced that Amazon would begin selling other OTT services through its Prime subscription service, the e-commerce behemoth announced that both Showtime and Starz subscriptions (along with 17 smaller, OTT-only providers) would be available as add-ons to Prime. Is this the sign of a new era in pay TV, where large OTT services like Amazon will begin to offer their own bundles, essentially replacing pay-TV operators? And if it is, is that a positive development for the industry? While it’s tempting to entertain the notion that Amazon could displace the MVPDs, it’s also unlikely. To begin with, it’s unlikely that Amazon will be able to strike deals with enough networks to create any kind of competitive alternate service. It’s one thing to get a few premium networks like Showtime and Starz, but quite another to get NBC. Showtime, whose service is also available through Hulu, seems to be taking the tack of making its apps available through as many outlets as possible. That’s not a bad strategy for a network that always seems to be a few steps behind HBO, despite having a wealth of quality current programming (“Homeland,” “The Affair”) and a fairly deep bench, (“Dexter,” “Queer As Folk,” “Weeds”). Providing one more location for non-subscribers to sign up makes sense for Showtime. It Doesn’t Make That Much Sense for Most Other Networks. That’s because the real value for networks in creating any type of standalone over-the-top (OTT) solution is the ability to gather data about their customers. While that value is offset by the costs of setting up and marketing an OTT solution, there’s not much incentive for them to let Amazon handle things, especially when Amazon, as a creator of Golden Globe and Oscar winning original content, is in fact competing with them. There’s no reason for any network to give that kind of valuable data about subscribers and their viewing habits to a competitor. Even less reason when that competitor is an online retailer like Amazon. Amazon could map that information to actual purchases and thus learn even more about the audience, and then use that information to inform its own programming decisions. While Amazon has had success with Prime’s original content, the rest of the service can be somewhat confusing. Amazon uses a hybrid SVOD/TVOD model, and so some shows and movies are available for free with Prime and others require an additional fee. Throw in a bunch of pay-to-subscribe programming from other providers and things can get even murkier. While Amazon may have some initial success selling additional subscriptions, we don’t see this solution–larger OTT providers selling subscriptions to smaller ones–becoming any sort of a trend. As we’ve predicted previously, we feel that the most likely future is one where MVPDs begin selling OTT services to their broadband customers as an alternate or add-on to their traditional pay-TV service. Tis the season once again for all the research firms to release their studies wherein they interview a small sampling of average Americans and conclude that cord cutting, cord shaving, cord nevering and all other manner of cord severance are about to explode. Because, you know, that’s what the 125 people in the survey said when prompted about it. The thing is, cord cutting is a lot like dieting. People think they should do it, talk a lot about doing it, but when that juicy 800 channel bundle is in front of you, it’s hard to give it up for some celery sticks. Especially once you figure out that if you get the celery sticks from the a la carte menu, it’s not really saving you anything over the all-you-can-eat option. So ignore all the salacious headlines about how 1 in 5 Americans will cut the cord by 2018 or how Millennials are never going subscribe to pay TV. (It’s uncanny the way those 23 year-olds can predict their own futures.) When the stats come out, those numbers won’t be there (again) and some of the cable MPVDs, long the whipping boys of the industry, are actually predicting full-year subscriber growth. While their reputation for tone deafness was not undeserved, most of the major MVPDs seem to be getting their acts together and doing something to improve the customer experience. Plus, as we’ve noted previously, the introduction of Nielsen’s TAM system next month is going to result in the rapid growth of TV Everywhere as the networks’ prior objection, that TVE views went uncounted, disappears and everyone in the ecosystem sees the advantage of it. That’s already happening, as Verizon’s latest version of it’s FIOS Mobile app allows users to watch programs off their DVRs. And mark our words, that’s just the start. That means the real cord you’d need to cut is to your broadband, and even the most click-baitish of the studies has yet to suggest that is happening. Native Advertising On TV: What Does It Look Like And How Will It Work? Native advertising has been a big hit on the web and sites like BuzzFeed have practically turned it into an art form. The format is not without it’s detractors though, who claim that it blurs the line between editorial and advertising. But in a world of ad block software, publishers are all in favor of a format that actually captures consumers’ attention. So how does this new ad format translate from the web to TV? 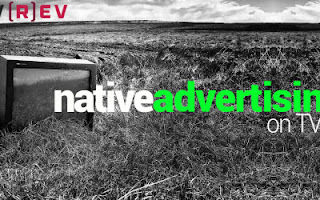 Can native advertising be the boon for television that it’s been for the web? What makes native advertising on television so hard to define is that unlike Buzzfeed articles, TV shows are long-form. So creating something that’s indistinguishable from the rest of the line-up is not as easily accomplished. Further complicating matters is the fact that many networks don’t have a defining “voice” anymore, which makes creating something in their “voice” somewhat Sisyphean. And while everyone from BuzzFeed to the Times has hired staffers to create native advertising for them, the closest the TV industry has come is a storyline on HBO’s “Girls” mocking the format. It might be easiest to start by defining what native advertising is not. There are commercials using the stars of scripted programming, in-character, but those are not native ads either, just co-branded promos. They feel like ads starring the show’s actors, not new, unreleased scenes from the show. Similarly, there are promos involving the stars of non-scripted programs like award shows. But those aren’t native advertising either, just (wait for it) promos involving the stars of non-scripted programming. They’re a throwback of sorts to TV’s first golden age, where announcers read copy about the show’s sponsor before the show began. Finally, there’s branded content, which is different because it’s not specifically about the product, but rather about a core value of the product. (Think Red Bull and their action sports videos.) Branded content can pretty much live anywhere and if it fits in with a specific network, great, but it’s designed to live in its own, which is what differentiates it from native. So the question remains: how do you do native advertising on TV. To start, let’s toss out the idea that every network can host native advertising. Scripted programming is no place for native advertising as a storyline about a brand (rather than a quick product placement) will be immediately detectable and seem completely out of place. That's why we feel that native advertising on TV will be limited to news and other non-fiction genres, where a story about a brand (or related to a brand) won’t feel out of place. It can live as a segment of a multipart show—a story about women’s prisons on a newsmagazine show would not feel out of place. Native advertising can also work on travel and entertainment shows (for brands in those categories—think a history of cable cars segment for San Francisco’s St. Francis Hotel) and on nature and science shows as well. In all these categories, the brand story can easily be woven in to the fabric of the show without rending it. There will be some pushback at first, as viewers come to grips with the new format and networks figure out where the line between editorial and advertising sits. But eventually the kinks will get ironed out and viewers will come to accept native advertising as a more entertaining alternative to interruptive. Brands will be happy with the higher level of engagement and networks will be happy with the new revenue stream. Making native advertising on TV a win all around. Star Wars has been all over the media these past weeks. Not just news stories about the movie’s upcoming debut, but dozens (if not hundreds) of promotions on everything from Ellen’s Heads Up game to successful product placement on something like a half dozen popular ABC shows. They’ve done such a good job of it, you might be tempted to think of it as the future of movie promotions. Not bad for a movie that came out 38 years ago. Other brands need to work harder in social media and beyond. They need to give something in order to get people to interact with them. That something can be entertainment, it can be utility, it can be information or even a financial reward. But while Apple could put up a blank Facebook page and wind up with 2 million fans, that’s a fluke, not an easily replicable formula. Ditto Star Wars. ABC’s showrunners are happy to integrate some Star Wars promotion into their shows because it seems natural. It’s something their characters would be talking about regardless, given all the hype around the upcoming release. To the point where I’m guessing many (if not most) viewers weren’t even aware they were watching a paid promotion. Compare that with Creed, the latest movie in the decades-long Rocky franchise. Creed is not as easy to integrate. While Rocky was an iconic movie in its day, that day has passed and I’m not sure how many people under 30 would even know what “Yo! Adrienne!” meant. That means you can’t easily weave the movie into existing TV shows (ABC or otherwise) without it feeling horribly forced. Ellen’s not going to come out with a “Creed Edition” of Heads up. And brands aren’t rushing to create sponsored co-promotions with Creed. That’s a movie from a well-known franchise too, one that’s probably going to make it’s investors money back. Smaller films, lesser known films, films that aren’t established franchises are all going to have to be promoted another way. A way that gives audiences a reason for wanting to interact with the promotions. 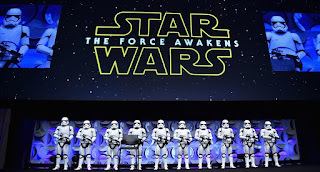 Unlike Star Wars, it’s not enough just to show up with your shiny robots and wisdom spouting elders in tow. People are going to expect something from you in return for their attention. Brands too. When Star Wars does a co-promotion with a brand, Star Wars is the star. When the movie is the latest Jennifer Aniston rom-com, that line gets blurry and oftentimes it’s Dunkin Donuts in the lead role, with RomCom as a secondary character. And that’s okay—not every movie is a star its first time out. 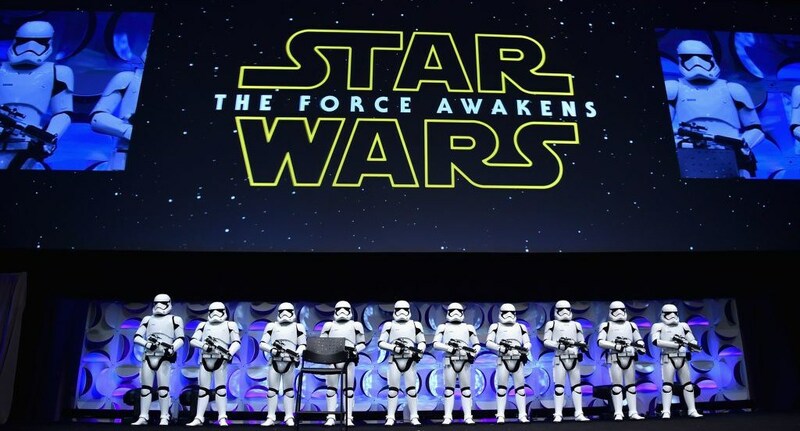 The Star Wars team has done a stellar job of promoting the movie’s return. That’s a high compliment, because with great expectations also come great falls. But they were up to the task and they aced it. So a round of polite golf claps. Or maybe even light sabres aloft. Just don’t think there’s anything your brand or your movie can take away from it, though. Unless, of course, you happen to be sitting on the next Star Wars. Otherwise, you’re going to have to work a whole lot harder for attention. That’s not necessarily a lesser proposition. It’s a short week and an American holiday, so in the spirit of that holiday, we thought we’d look back on what we have to be thankful for at the end of November 2015. What’s more, as we pointed out last week, the MVPDs seem to have figured out that it’s in their best interests to play nice with the Netflix, Hulus and HBO Nows of the world. And so they are starting to bring them into the fold, selling them directly to their broadband and pay-TV customers as just one more option. When all TV options come from the same place (the MVPDs and their broadband connections) cord-cutting is no longer an issue. While Social TV 1.0 was all about fans talking to each other, Social TV 2.0 is all about networks buying paid posts on social platforms. Facebook seems to be leading the way on this, primarily because (a) at a time when fewer and fewer people watch TV in real time, it’s not a real time platform, (b) 1.5 billion users. It’s hard to beat that kind of reach. (Twitter, by comparison, has about 300 million. And many would cut that number in half, given the number of users with multiple accounts) and (c) Facebook’s Atlas ad network allows those paid posts to be seen by millions of highly-targeted users on mobile sites. For network execs, whose biggest nightmare is how to drive viewership, social TV is proving to be a godsend. For years, The Powers That Be have rolled their eyes at YouTube Creators, lumping them all under the blanket of “UGC” and otherwise not paying a whole lot of attention to them. That’s changing now as everyone seems to have discovered their extreme money-making potential. The MVPDs are busy launching broadband-only skinny bundle packages aimed at Millennials and they’re populating them with “snackable” content from the various MCNs. This alone is doing wonders in terms of making YouTube creators a part of the overall ecosystem. We’ve also seen the recent launch of YouTube Red, the platform’s first ad-free subscription service, that features premium content from well-known creators like PewDiePie. By giving more structure to the creators’ shows, Red is helping to make them more like traditional TV without sacrificing the things that made them successful in the first place. Now that Nielsen is measuring OTT views and networks are realizing the value of letting people watch their shows anytime and anywhere, true TV Everywhere should finally be on the horizon. There are already reports of Verizon rolling out an update to their TVE app that allows viewers to watch every single channel if they’re at home and gives them access to shows they’ve stored on their DVR. We expect the rest of the MVPDs will soon follow suit. There’s much good news in the TV industry, but still much to figure out. Stick with TV[R]EV as we help you understand all the changes ahead by subscribing to our twice-weekly newsletter.